I took this photo yesterday, because soon they're going to start redeveloping it, and this view will disappear, probably forever. They're going to do this to it.. 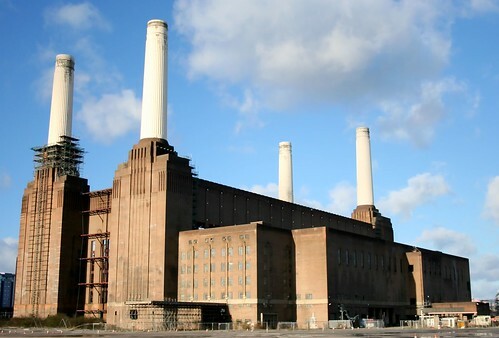 The Power Station has been one of my favourite London landmarks ever since I went to the funfair as a young kid, and was scared out of my wits by the roller coaster in the early seventies. In fact I didn't go on a roller coaster again for about ten years. It was permanently closed down after five children were killed and thirteen others injured in an accident on 30 May 1972 when one of the trains became detached from the haulage rope, before rolling back to the station (the anti-rollback mechanism having also failed) and colliding with the other train. This is the worst accident in history of themeparks.